With the 3-litre Formula 1 now two years old, both Lotus and BRM brought 2.5-litre variants of the F1 cars to Tasman for 1968. Lotus had simply put a 2.5-litre Cosworth DFW into their normal F1 cars and brought two Lotus 49s for Jim Clark and Graham Hill. BRM had abandoned their H16 engine and were using the Tasman series as a test session for their new V12 engines and Len Terry-supplied BRM P126 cars. Drivers would be Bruce McLaren and Pedro Rodriguez, also both new to the team, and an old P261 V8 was available as a backup. Double World Champions Repco-Brabham sent a F2 BT23 for Denny Hulme with Cosworth FVA engine and Jack himself had a new BT23-based special with Repco V8 engine for two guest drives in Australia. Two F2 McLaren M4As were also present and showing off the power of Cosworth's preeminent FVA engine. The big news was that Kiwi Chris Amon was back at the Tasman Cup for the first time since 1964 and had persuaded employers Ferrari to field a car. 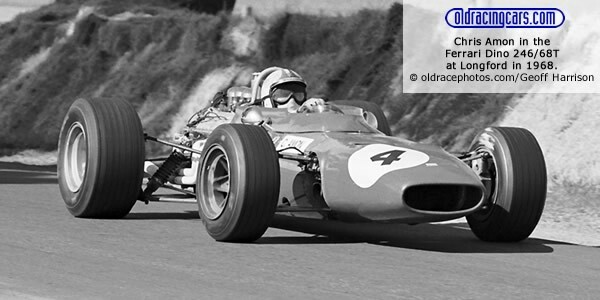 This was a 166 Formula 2 car fitted with a 2.4-litre Dino V6 engine, as used in Ferrari's early 1966 F1 car. Amon was fastest in the opening races, when the better of his two engines was performing at its best, and won the first two races. He was second to Clark at Wigram but then hit problems and slipped back, allowing Clark to take control. The Scotsman went on to take his third title. Once again, Frank Gardner had the best of the locally owned cars. Alec Mildren had commissioned another BT23-based special, this one fitted with a 3-litre Alfa Romeo Tipo 33 V8 engine and the Australian expat was right on the pace, finishing a deserved second to Amon at the opening race and taking two further podium positions. The Climax FPF was now utterly outclassed - it scored just six points in the Tasman series and not one in the following Australian Gold Star season. 18 Feb 1968 > Warwick Farm "100"
All cars are 2.5-litre Tasman formula cars unless otherwise noted. From 1964 to 1969, Tasman Cup races were held to a 2.5-litre engine limit. Despite local experiments with Alfa Romeo and Maserati engines, the Climax FPF engine dominated the first few years. Engine technology then advanced rapidly, first with BRM's 2-litre V8 engine, then a 2-litre Climax V8, then Brabham's 2.5-litre Repco V8s and finally the 2.4-litre Ferrari V6 and 2.5-litre Cosworth DFW. The 1964 to 1970 Tasman race results are based on the results at Bruce Sergent's website www.sergent.com.au which Bruce kindly allowed us to use as the basis of our coverage. Chassis identities were researched by Allen Brown in the 1980s with the generous assistance of John Blanden, Denis Lupton, Bryan Miller, David McKinney and others. Email Allen at allen@oldracingcars.com with any further additions, corrections or comments.